Betty Crocker chocolate cake mix, 3 eggs, 6 tbsp oil, 250ml of water, creme eggs, softened butter and icing sugar. The night before freeze the creme eggs in the freezer (that’s the magic part) Preheat the oven add the cake mix, 3 eggs, 250ml of water and 6 tbsp of oil into a bowl and whisk until the mixture is smooth. Place the cake mixture into the baking tray and nestle the creme egg in nicely and then cover with cake mix. Place them in the oven for 20 minutes and the magic begins..
Due to making 18 I found that the larger baking tray (more muffin sized than cupcake) turned out better than the little cupcake sized ones above. They’re still just as yummy but the bottom was a little soggy due to not as much mixture / room in the baking tray! Because the creme eggs are frozen prior to baking they don’t melt when they’re in the oven.. when you cut the cupcake open you should have something that looks like this..and drool. 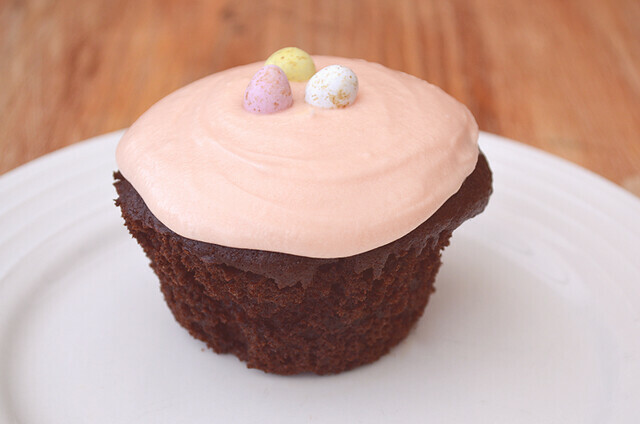 Decorate the cupcakes with buttercream icing and little mini eggs (perfect for easter.) No one will know the gooey creme egg surprise that awaits them inside.. until they take that first bite! So..What do you think? I think These would make a great (and yummy) easter dessert or gift! p.s Don’t forget to freeze the creme eggs the night before you bake! otherwise they’ll melt when you bake them! They look super amazing! I can't wait to try them myself! I think I just put on some weight by looking at them hahaha! OMG. I have to make these. They look incredible!! Omg..I think I just died when I saw this. There goes my diet! These look incredible, did you use mini cream eggs? I definitely want to try these out! YUM! These would be so so gooey! These. Look. Incredible!! I'm definitely going to attempt them! Come visit my blog soon and say hi, and spread the word! Oh.My. A girl after my own heart! They look absolutely incredible! Hello chocolate coma! 😀 Totally making these. These look yummy. I do find creme eggs a bit sickly though so it may be too much for me! They look nice, I was thinking of making them for my Guides for our last meeting before Easter, but I guess they'd work out quite exp if each one uses a whole Creme Egg..
omg these are the yummiest cupcakes i have ever seen! cake + creme egg. perfect. OH MY GOD. I neeeed to do this. Seriously creme eggs must be my favourite type of chocolate ever and cupcakes my second, so definitely going to get on this. Best idea all week! Wow they look super, I'm definitely going to try these! 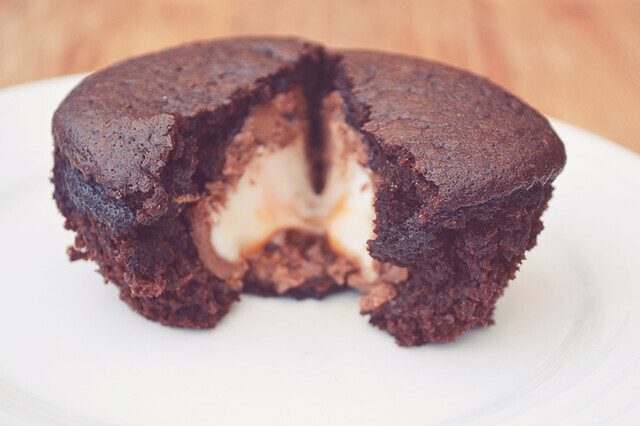 Oh my gosh, this is combining my love of muffins AND creme eggs in one big gooey go…YUM! Omg I have to bake these!! Going to buy the stuff tonight and going to make them tomorrow! :) Thanks for sharing! Mmmmmmmm. I love creme eggs and I love cake so mixing the two sounds amazing and look amazing too! 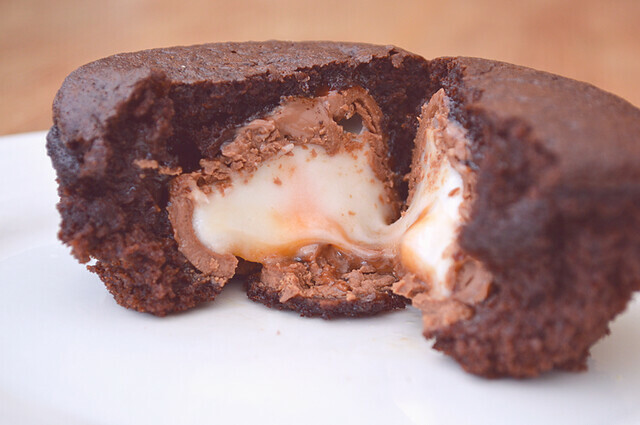 These look amazing but also quite sickly, may make these with the mini creme eggs just incase! Amazing idea, they look incredible! Oh my gosh these look absolutely amazing! Will definitely be trying them tomorrow! Such an amazing idea! Oh my gosh! These look amazing. You come up with the most amazing ideas! oh my holy hell!! 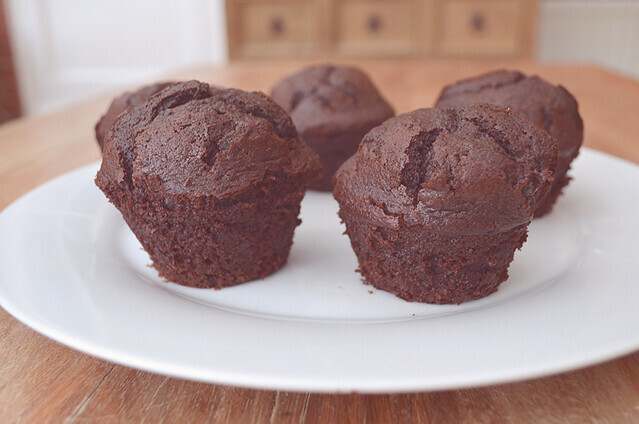 i have to try these…think i might give the brownie version a go though! Wow; at Easter I develop obsessions for creme eggs and I don't think I could say no to some of these! I NEED THESE IN MY BELLY NOW! Incredible. sooo manking these for my friend's and i's fat friday next week! Thank you! These look so amazing, I really need to stop reading these food posts you do, I always want to make them straight after! These look gorgeous! My psychology class have "cake fridays" so I may have to give these a try. Oh my goodness, you have to stop doing this to me! These look SO delicious. Absolute heaven. These are absolutely perfect for Easter, they look utterly scrumptious – thanks so much for sharing. This makes our mouth water just looking at them! We're going to try in vain to replicat this! this looked delicious! I just made a similar dessert on my blog : The White Chocolate Swirl! Oh wow! These are absolutely amazing, I do love your quirky recipes they always look so yummy! AMAZING! What a great idea and they look so good. These are going on my list to make. Yummy! these look absolutely amazing, mmmm! WOW they look amazing! I would love to try and make my own sometime! mmmm.. I'm so hungry!!! :DD they're soo cool and seem to be delicious and soft!! These look incredible! Definitely need to start trying out some of your recipes…everything you make looks delicious! Oh my, these look so good. Thanks for sharing, I'm going to try this! I NEED to make these! They look amazing and crème eggs are my favourite :). Thank you so much for sharing this :). OMG!!! I need to make these! 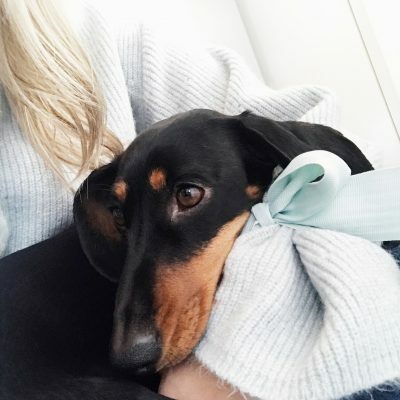 I am now following you, I'd love it if you could follow me too?? these look amazing. I made the brownie version over the weekend and now feel the need to make these too. I'll make sure to link back to this when i mention cupcake style. this could be cute with the mini creme eggs too. These look amazing! I bought some mini caramel eggs today that I'm going to try them with! That is the best thing I have ever seen 🙂 perfect for Easter. Oh wow. These look incredible.